It’s Audrey’s 3rd Christmas! For her first, she still needed oxygen at night time, she was still breastfed and she had her first taste of food (puréed carrot) on New Year’s Eve. 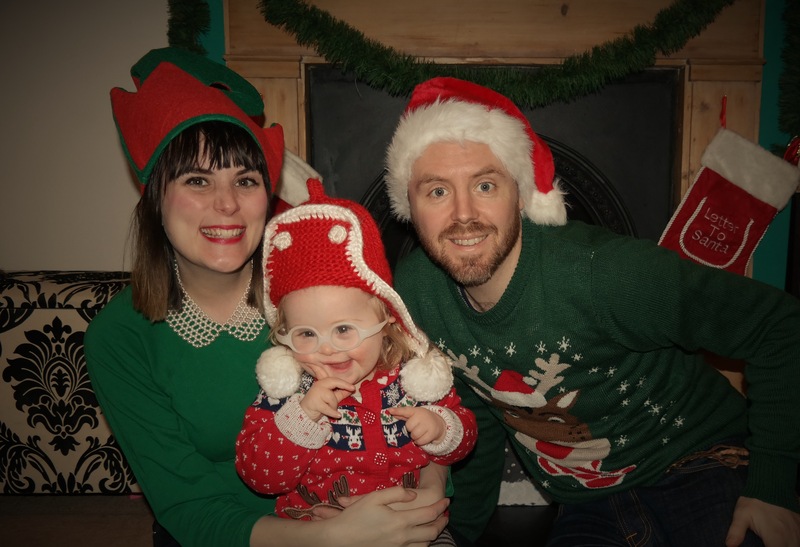 Audrey’s second Christmas was a bit more fun for her, she met Father Christmas (and cried), she got to try some lovely treats (a chocolate Yule log that made her very excited!) and she was able to sit up and play with her toys (wrapping paper mostly). 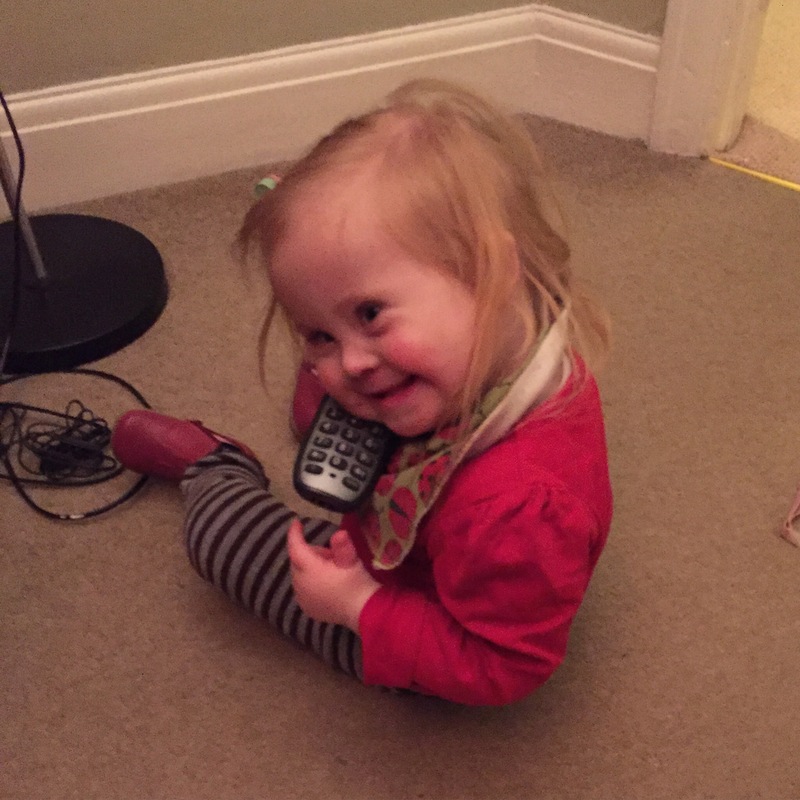 And now we have a mobile little miss who can chat, in fact, she says “Missmass” – which means Merry Christmas/Father Christmas/Christmas. She loves to sing and sign Little Donkey with me and she is a big fan of mince pies too. We’ve even had two trips to see Santa with no tears. It’s Christmas Eve and the little lady is asleep upstairs at Bibi’s house and she has no concept of the presents and fun that await her tomorrow… She does a great line in “Wow!” for present opening, which is going to be fun and I think she will be spoilt rotten. Next year, we’ll have a little brother to throw into the mix (eek!) and I think Audrey will actually know a bit more about what’s coming, so excitement could reach fever pitch! I absolutely love Christmas, so I’m up for all the effort required to make Christmas magical for kids and I can even handle the frenzied build up; bring it on! Merry Christmas everyone! We hope you have a lovely time, however you choose to celebrate. All the best for 2016 – wish us luck – we’ve got a boy on the way! So, I’ve written two posts about Audrey’s physio sessions on a Friday and they are not physio sessions! Oops. We were filmed last week by Katy (who is going to be featuring us on a fabulous website, relaunching in January 2016, don’t worry, full details will be supplied!) and Katy casually asked something about the physiotherapy and the woman leading the group gave a glare and corrected her – this is ‘Conductive Education’. So there you are, that’s what we do on Fridays that helps Audrey and upsets Mummy! Getting Audrey out of a two-week virus with horrible face rash has been great, she is eating better, her face is back to its usual beautiful self and she is on form. Chatting and playing happily, in constant need of cuddles and then requesting to be put back down – she is bossy! This week I went on a 2 day Makaton for Professionals Foundation Course which was great. I now know the signs from Stages 1 to 4 (plus some additional) and a bit of background, as well as teaching methods. I find Makaton and lots of early years education very inspiring and I’m excited to share more signs with Audrey and potentially move towards working in an area where I can teach/use Makaton regularly. Christmas is rapidly approaching and if you don’t already know, I am a BIG FAN. I love mince pies and Christmas songs and twinkly lights and the general good mood that swoops across the country at this time of year. Audrey is still a bit young to fully understand the joys that await, but we are getting there… The dancing Father Christmas we get out every year was a bit scary for her last year – she’s loves him now. He’s had lots of cuddles and I’ve listened to his “Oh if Christmas makes you happy…” Song more times then I’d like to at this point in December and Audrey has already worn her Christmas jumper 3 times! Today we had fun at a Christmassy version of a local music class we go to. I watched a little girl sit with Audrey and dance with her and they both checked out each other’s feet… Another little girl very kindly gave Audrey an elephant during the crazy scramble for toys and I was just generally loving seeing children just get involved with each other – not seeing any differences. Actually kids do often point and stare at Audrey; because of her glasses. In a shop the other day, I heard a little boy say “That baby had goggles on!” Which made me laugh. We also got on the bus the other day and a 4 year old thought Audrey was hilarious, she said “I’ve never heard a baby talk before!!”. In other news, Audrey’s baby brother is giving me a good kicking, we are on week 29 and counting, but having two children terrifies me, so best to keep him in there kicking for a while longer. 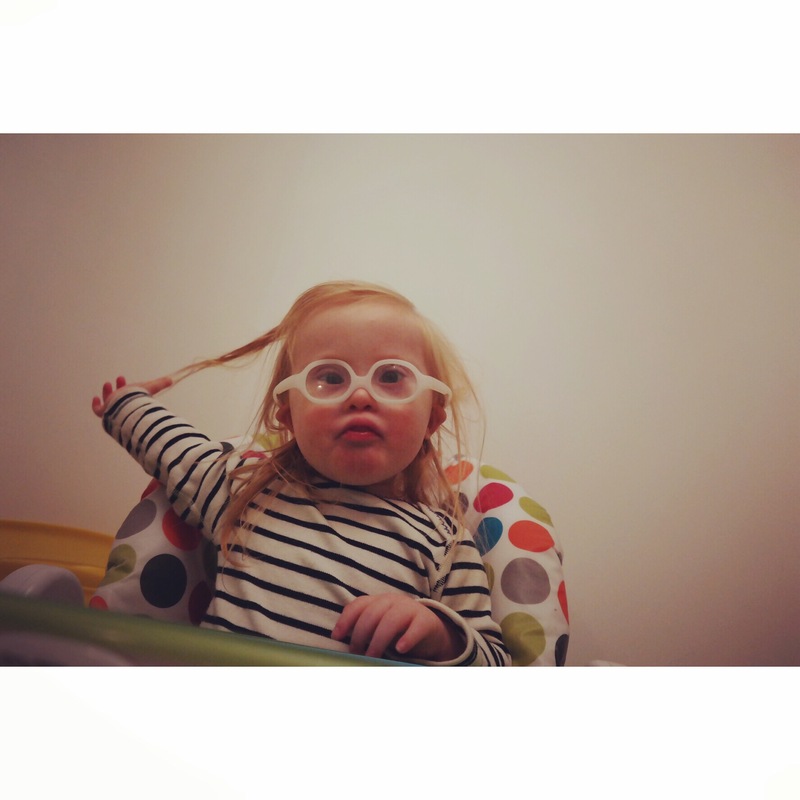 Here are some snaps from Audrey’s Conductive Education… It’s so amazing to have a picture of her standing up/walking! Stereotypes; there must be more to life? I was recently lifted by the sight of something so simple, natural and not out of the ordinary. Yet it was just what I wanted to see and it challenged that stereotype of a person with Down’s Syndrome that I found so desperately upsetting when Audrey was born. 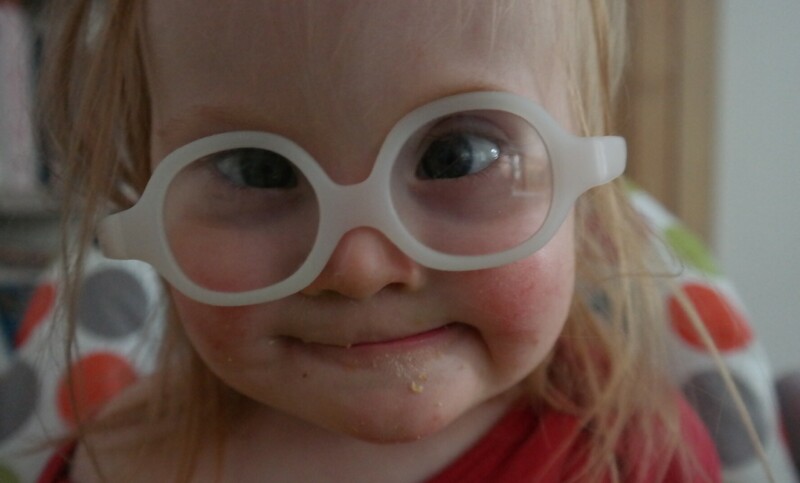 I saw a young woman with Down’s Syndrome shopping with her dad in a supermarket. She had on colourful clothes and was carrying a blue Michael Kors handbag. I was watching them from afar (Audrey was asleep in the buggy) and as we went through the checkout and I noticed that Vogue was on offer (only £2! ), I glanced down the rows of checkouts to see if she was still around… Just in time to see her leaving with a Vogue tucked under one arm. This ridiculous thing made me feel so happy. I tried to think why… And I decided it’s about inclusion, representation and knowledge. Maybe it wouldn’t seem so amazing to see a fashionista with Down Syndrome if one popped up now and again on TV or in a magazine. This is what I love about social media when it comes to the DS community. I can explore the diverse world of; people who are like me and people who are different. These two things make me happy in so many ways. Well it makes you feel… connected. You can have banter about those things that you share in common, like shiny new Nike Airs or a good lemon drizzle cake or getting a fringe cut in. 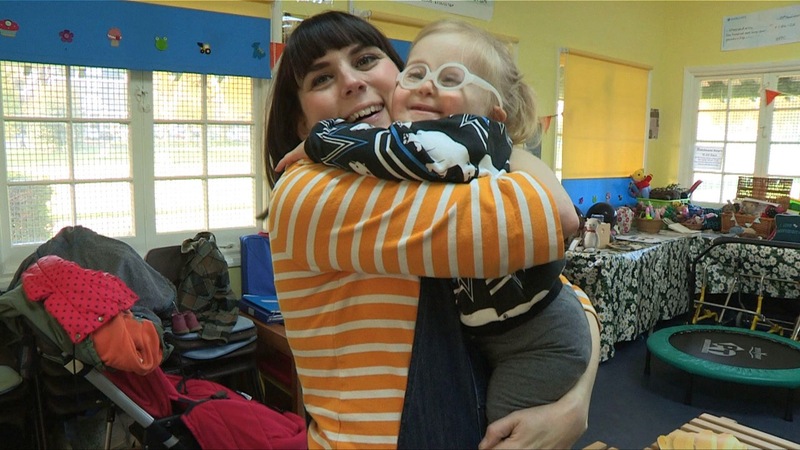 What does the mother of a child with special needs look like? Is she mumsy? Old? Plain? Sensible? And what hobbies does she have? Knitting? Volunteering? Does she like music? Probably Cliff Richard? Or Daniel O’Donnell? Well those preconceptions can be shattered. Call me crazy, but pre-Audrey I imagined families with children with special needs. I thought: geeky. Respectable. Good. Boring. Worthy. A grey, depressing world. So I love to see families with children with special needs who do not fulfill that grey expectation… tattooed, blue haired, fat, thin, trendy, twee, perfect, messy, tacky, stylish… it’s just fun seeing that there are so many different families out there tied together by having that someone who has an extra chromosome. And we are all “representing” (this needs an American accent, doesn’t quite work in a British voice!). We are showing the spectrum rather than letting people imagine the grey. Something that helps bind us to these families are the facial characteristics that are common in people with Down’s Syndrome. Imagine seeing another family whose child looks remarkably like yours… Freaky? Yes it can be a bit! But of course we see the beauty in those faces and we feel connected. It’s pretty amazing actually. An extended family. A couple of months ago, I had my haircut at a new hairdresser. I have had the same home hairdresser for years and she was away and I needed sorting asap. So I had to go through the motions of small talk with a stranger. He was young (28), bearded and tattooed, I worried we’d have nothing to talk about, but he had a 5 week old baby girl and 2 stepsons so that made it easy; we can talk about kids, hurrah! I mentioned at that point we hadn’t really told everyone about our pregnancy as we were waiting for the 20 week scan, feeling a bit nervous after a miscarriage. He understood, he had some friends… They had the “Down’s test…” and I’m thinking “Oh no, don’t go there…” It was an out of body experience as I felt a bit sick and waited for him to finish this sad story of his friends and their scan… The baby had an extremely rare condition, it wouldn’t have survived, so they had a termination. A sad story and at this point I felt the need to say “I should probably mention that my daughter has Down’s Syndrome..”. He was a little embarrassed and rambled a bit about this specific condition not being like Down’s Syndrome and it was a bit uncomfortable for both of us. I felt I had a real opportunity to educate but I didn’t want to sound like I was preaching and I did find the situation difficult. He asked me “Is it tiring?” and I have to admit I wasn’t entirely sure what he was referring to at first! “Having a child with Down’s Syndrome?”, “Oh no! In fact, she’s probably not as tiring as her peers as she can’t run riot and she’s just very gentle and content most of the time”. 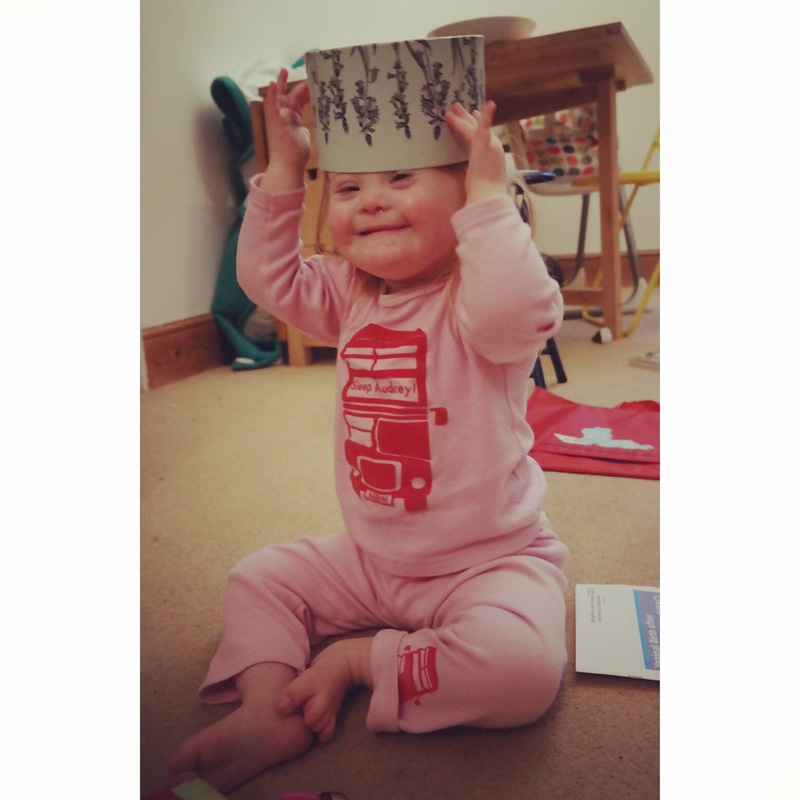 It was weird discussing Audrey in this way; as a child with DS, rather than just a child – and someone wondering “Your kid has Down’s Syndrome, wow, what’s that like??”. We bang the drum for inclusion and I guess some people wonder why. My brother actually thought it was funny we were so obsessed with seeing people with Down’s Syndrome on TV – I think to a certain extent he was being cynical in that advertisers and channels can use disability inclusion to ‘score brownie points’. And I get that. Pre-Audrey I may have agreed. “Oh they’ve shoe-horned a character in a wheelchair into this story line, yawn”. But now I view those things oh so differently. I am excited by the representation of minorities in the media now. No, I don’t want to see a Down’s Syndrome character forcefully added to every TV advert, but to see a face from our community every now and again is a nice feeling. Especially when it’s just representing life, not trying to represent disability. And that’s what I’m trying to do with blogging about Audrey, just represent our life. And maybe (hopefully) we’ll reach someone who needed to see our life in order to change their perception of Down Syndrome for the better.